An assorted buffet of International cuisine will delight all appetites at Flavors, the Buffet at Harrah’s. Choose from diverse selections of Italian casseroles, Brazilian BBQ, Southwestern dishes and plenty of choices of Asian fare. Cooking stations set up throughout the restaurant provide fresh, hot selections sure to please any type of diner. Save room for dessert because the gelato buffet offers homemade gelato, sorbet and a scrumptious chocolate fountain. 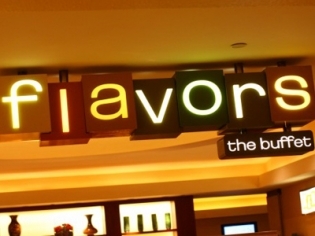 Flavors Buffet regularly offers an all-you-care-to-drink special including Coors or Miller beer, house red and white wine, bloody marys or mimosas. Really good food for the price! There are plenty of vegetarian selection unlike other buffets in the area. Food is fresh and flavorful. Highly recommended, get the buffet pass for all you can eat for 24 hours. The buffet was big and clean. Food selection was great. Great prime rib carving station! Our group compared this to a Hometown Buffet. Food was ok, but nothing really stood out as excellent.